When my son receives a Monday Box, his assigned task, as he happily munches, is to critique the contents. Along with tried and true favorites, I often send him cookies that I consider to be a works-in-progress. These are cookies that meet my deliciousness and care package worthy standards, but are missing a yet to be defined something. I don’t know what most moms talk to their 21 year old sons about on the phone, but as my son walks through campus, going to or coming from class, we often talk about cookies. 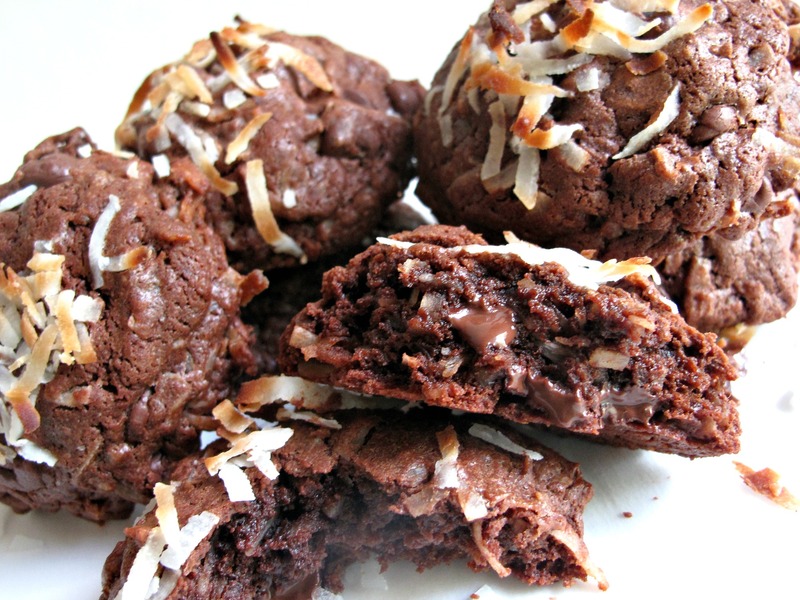 That is what happened with these Chocolate Coconut Bliss Cookies. 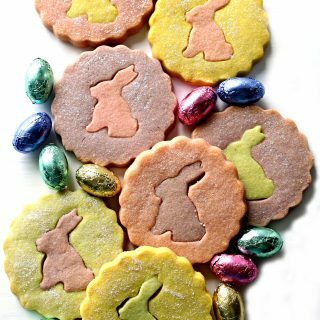 I found a recipe for a wonderful fudgy chocolate cookie on Bake or Break. I mailed a batch to Chicago. I was pondering how to add my personal spin to the recipe. My son suggested coconut. I didn’t know that he liked coconut. His likes have expanded exponentially since he went to college and I can’t always keep up. His idea was brilliant or at the very least really delicious. The addition of coconut to the already intensely chocolate cookie makes a candy-cookie hybrid. Think Mounds candy bar in cookie form. 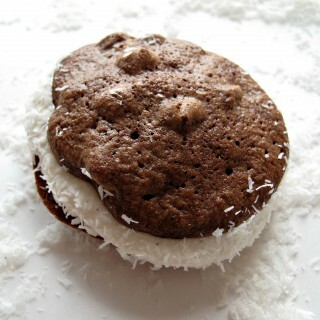 One bite of Chocolate Coconut Bliss Cookies and you are in an ultra-chocolaty, chewy coconut state of happiness. I questioned my son’s suggestion of adding coconut on top. When I protested that the coconut would brown on top, he asked if that was a bad thing. It’s not. The coconut browns but doesn’t burn. It both looks good and tastes good. 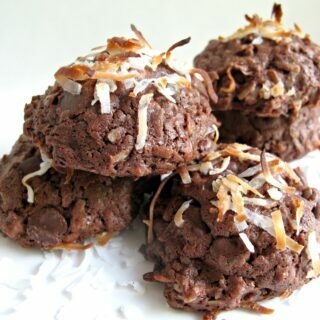 Our collaboration Chocolate Coconut Bliss Cookies were shipped to Chicago the following week. Usually St. Louis to Chicago takes one day. Due to a series of UPS foul-ups, we unwittingly discovered that the cookies last quite well (no melting and still chewy), even in summer heat, for up to 5 days. Though not long lasting enough for a long distance military care package, these cookies fit the criteria for shorter distance care package goodies. A note about coconut. 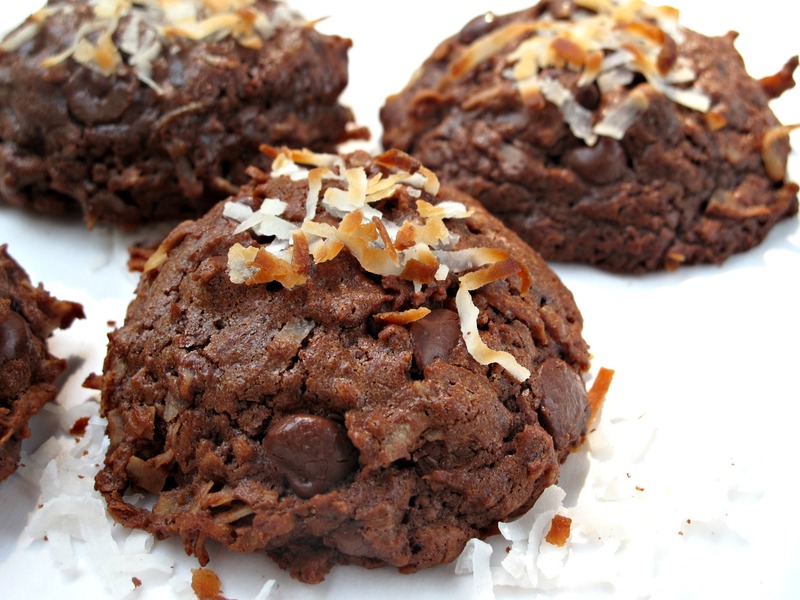 Chocolate Coconut Bliss Cookies are very sweet. 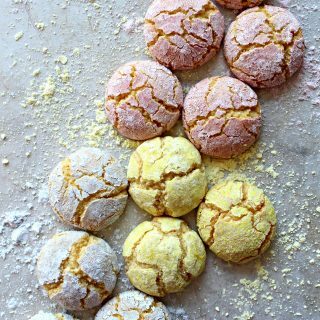 You don’t need to use sweetened coconut, however, the cookies with sweetened coconut stayed chewy just a wee bit longer than the cookies with unsweetened coconut due to the moisture in the sweetener. Heat chopped chocolate and butter in the microwave, stirring every 30 seconds until just melted. In the bowl of an electric mixer, beat eggs, brown sugar, and vanilla until fluffy. Add in flour mixture until just combined. 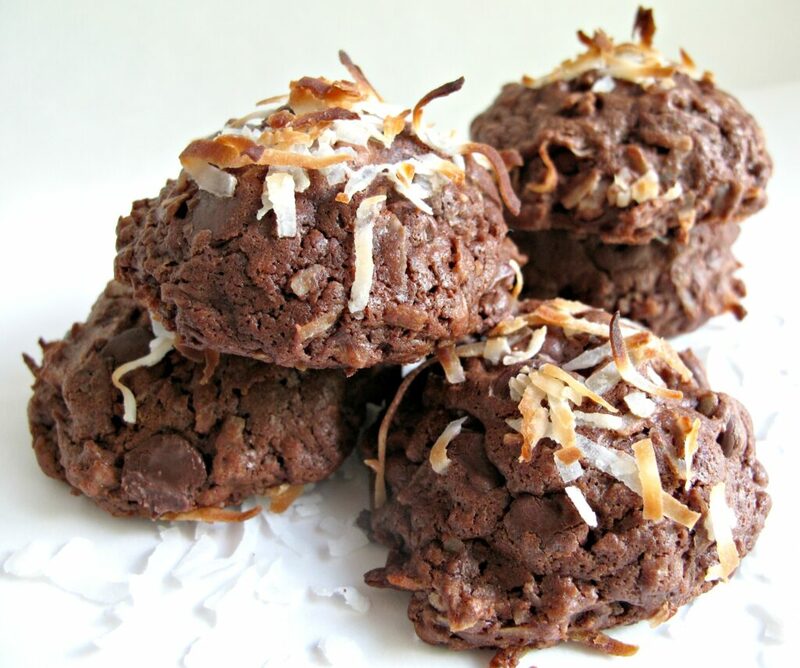 Stir in chocolate chips and ½ cup shredded coconut. Using a large cookie scoop or 2 tablespoons, scoop cookies onto prepared baking sheet 2 inches apart. Gently press a pinch of coconut onto the top of each cookie. Bake for 10-12 minutes. Cookies will have a shiny crackled surface. Cool on baking sheet for 10 minutes then transfer to wire racks to cool completely. Store at room temperature in an airtight container for up to 5 days. Double wrap pairs of cookies (with bottoms together) in plastic wrap, then place in an airtight container or zip lock bag. 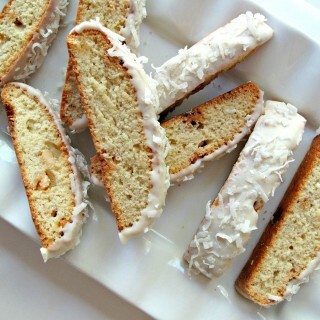 These treats are sure to provide additional coconut bliss! Click on the photo for the recipe! Never miss a new delicious recipe! Sign up to receive email updates from The Monday Box and bake some love today! Check out our informative posts on Facebook and fabulous finds on Pinterest too! 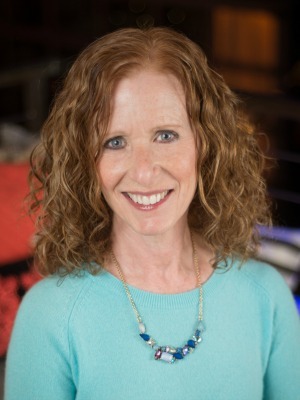 Wendy – these look fantastic!! Oh, Winnie! I think about you and all of Israel constantly and pray for peace before more lives are lost! Baking seems so frivolous in light of the dangerous reality of rockets, but it can be a mental and emotional escape during this time of high tension and stress! Wishing you sweetness and shalom, conflicts resolved! These cookies look so wonderfully moist and fudgy. The coconut addition does sound genius! Kudos to you and your son. Thanks, Monica! I cherish the fact that my son and I talk. Having a shared interest is fun and as you know doesn’t happen by accident. We cultivate shared interests every time we share our passions (whatever they may be) with our kids. Being able to critique what he is eating means your son is thinking about his personal tastes and why something does or doesn’t appeal. I think thats wonderful! Opinions were never in short supply at my house! 🙂 I love your posts with photos of your son cooking. They make me nostalgic AND make me smile! haha I love that you talk to your son about cookies! And the coconut addition idea? Awesome! 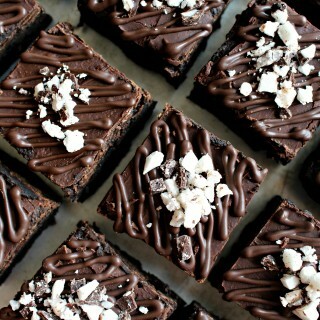 I love that it gets all toasted on top and with the chocolate base … I bet these are delicious! Thanks, Ashley! I also talk to my dog about cookies but those conversations are rather one sided. 🙂 Its good to have a human to give feedback. 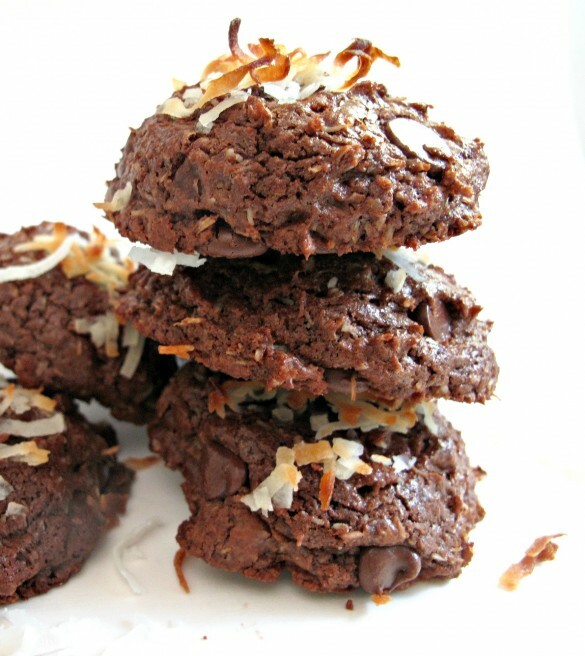 The chocolate and coconut make these cookies chewy little cookie-candy bars. Wendy, what a lucky son you have and such an incredible relationship between you two. Can I call you so that we can talk about cookies, too? It’s one of my favourite subjects! 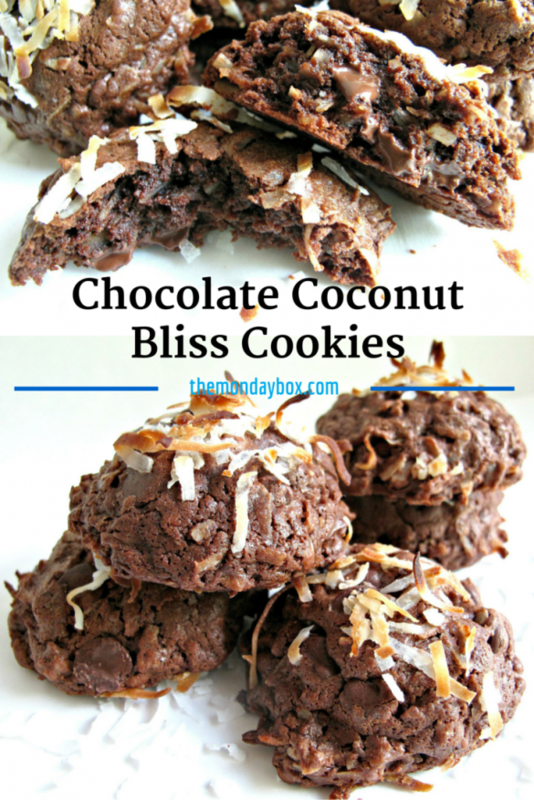 These chocolate coconut bliss cookies wouldn’t last one day in my house. I’d devour them all in no time. They’re gorgeous! The photo with the cookie split in half, showing the melted bits of chocolate inside, is calling my name. I’m going to hold you to that, Wendy! With the promise of gooey melty chocolate cookies, I’m going to do whatever I can to meet you someday! Wow, these look awesome. 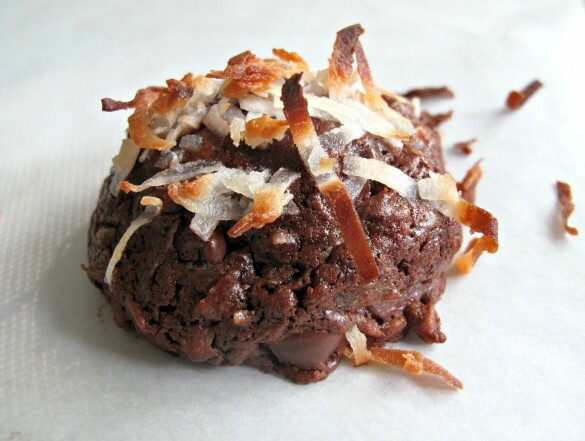 Toasted coconut and tons of chocolate, what could be better. These look fantastic! I’m gonna have to give these a whirl soon!! Thanks, Faith! We loved them. I hope you do too! These look delicious! I’ll have to try them out. 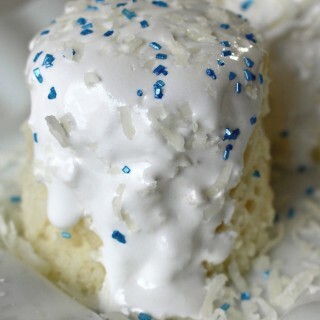 I love anything with coconut!!! I will for sure be making these. Thanks, Chris! My son is the whole reason that The Monday Box started. My search for care package recipes to send him at college led me to the idea for the blog. Only fitting then, that he is my official taste tester and flavor collaborator! 🙂 These cookies really are like Mounds bars in cookie form. Your husband would love them! Thanks, Maureen! I think your husband’s young employee would be delighted with these cookies. 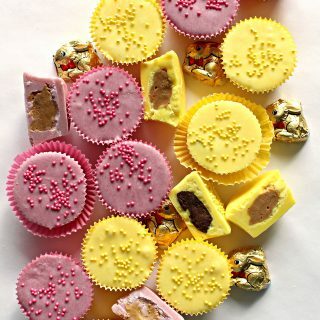 They are definitely a comforting sweet indulgence! Wendy, these are like my favorite Mocha Coconut Frappuccinos at Starbucks! But in cookie form! THEY ARE AWESOME! Of course coconut was the missing ingredient. Everything is better with coconut. Your son is wise young man! I love how you guys collaborated on these cookies. And I would be remiss if I did not mention how great your photos are in this post. Beautiful! Thanks, Cindy! I have a lot of learning to do. I knew that everything is better with sprinkles. A short glance at my abundantly sprinkled cookies and bars confirms that. But, I had no idea about the transformational power of coconut! I will be applying that new found knowledge liberally in the future. 🙂 Thanks you so much for your kind words about the photos. Lighting and composition are an ongoing struggle for me, so its reassuring to know that I may be getting closer! These look blissfully delicious! Love that your son helped you tweak and improve the recipe – he is paying attention and appreciates your care packages. 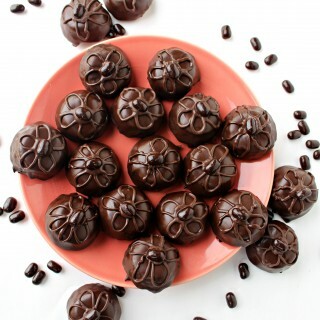 I adore chocolate and these would make me very happy! Thanks, Tricia! My son has always been my Monday Box recipient and main taste test critic. He doesn’t eat a lot of sweets though, so after a few cookies, I think his buddies have enthusiastically shared the Monday Box contents. 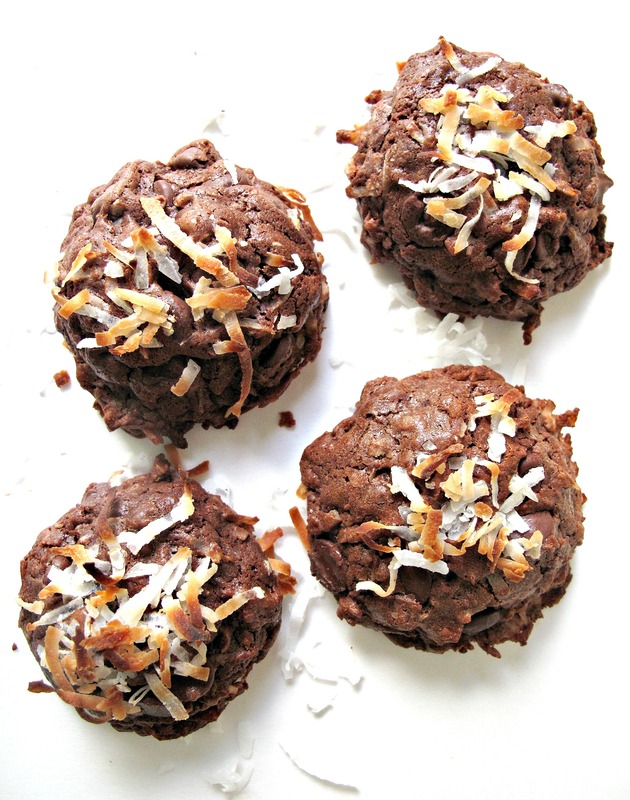 🙂 With these cookies, I wasn’t even thinking about coconut until my son made the right call! Wendy, I would bet that your son is the most popular college student in Chicago right now, because THESE! Also because i’m sure he’s a pretty great kid. 🙂 I absolutely love chocolate and coconut together; while we were in florida, there was this ice cream place we frequented (*ahem* regularly) which had the dreamiest toasted coconut and chocolate chip ice cream…it was the most perfect thing ever, and i can imagine these cookies are no different. Thanks, Shannon. 🙂 During the school year, I think there were people who would randomly “be in the neighborhood” of my son’s room on Tuesdays, the day the Monday Box arrived. 🙂 This summer, he is more or less on his own immersed (or sometimes submerged) in a chemistry course. I send less and he freezes more. I need the name and address of your Florida ice cream place! 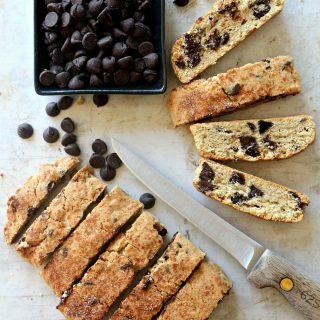 Toasted coconut and chocolate chip DOES sound like the most perfect thing ever! I definitely think his idea for coconut was brilliant!! 🙂 These cookies sound awesome! These are perfection! Thanks for linking up with What’s Cookin’ Wednesday! Thanks, Karly! Thanks for hosting What’s Cookin’ Wednesday! Lots of great recipes!